This recipe included pre-sliced beef bottom round steak that I can pick up at Walmart frequently. 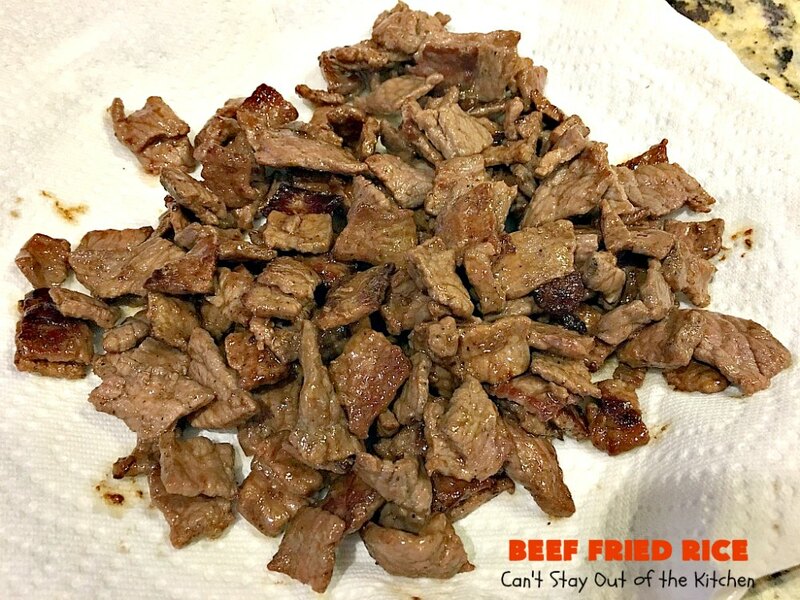 I cut the strips down into smaller bite-sized pieces when I stir-fried this recipe. I included peas and carrots, green onions, bell pepper, garlic, pre-cooked and cooled rice and scrambled eggs. I used Tamari low sodium soy sauce (which is gluten free) but also oyster sauce to give flavor. Oyster sauce uses soy sauce, which in most cases, is NOT gluten free. 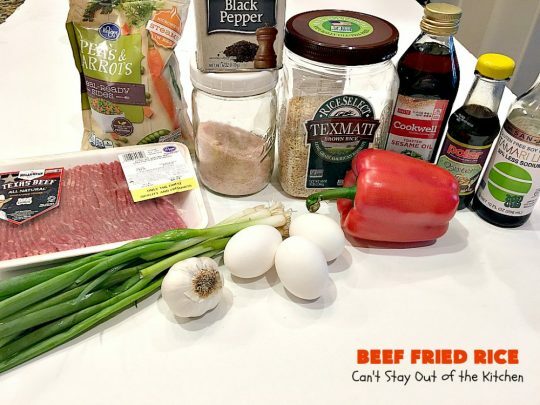 So this recipe is not gluten free unless you omit the oyster sauce or make your own with a gluten free soy sauce. Because the soy sauce is low sodium, I included salt and pepper to amp up the flavors. It also includes ginger to kick up the flavor a notch. We visited my mother-in-law and her husband in Florida for the Christmas holidays. A couple of times we stopped at a local Chinese Restaurant to pick up take out. Okay, yes, I have a Chinese food addiction. I love the stuff! 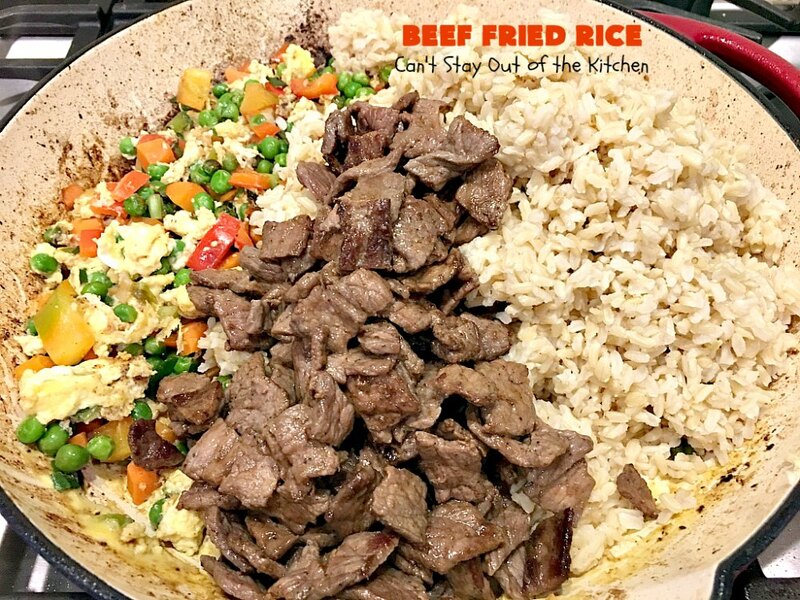 Imagine my surprise when we picked up a box of Beef Fried Rice, Chicken Fried Rice and Veggie Fried Rice and the only thing in the meat ones were meat (beef or chicken), rice and onions! That’s not good fried rice in my book. Back in the early 1980s I used to have a McCall’s cookbook specifically for Chinese food. 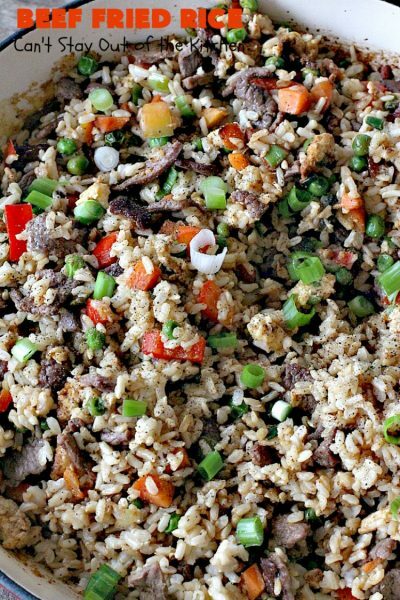 That cookbook had a great recipe for Fried Rice that I loved. It included lots of veggies with pork which was fantastic. 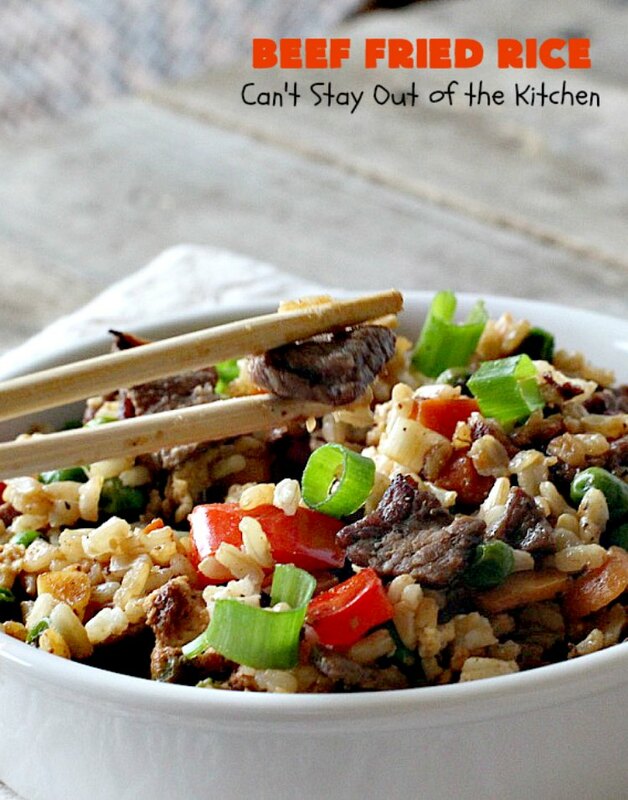 So that recipe (which I no longer have) was always my model for making any kind of Fried Rice. 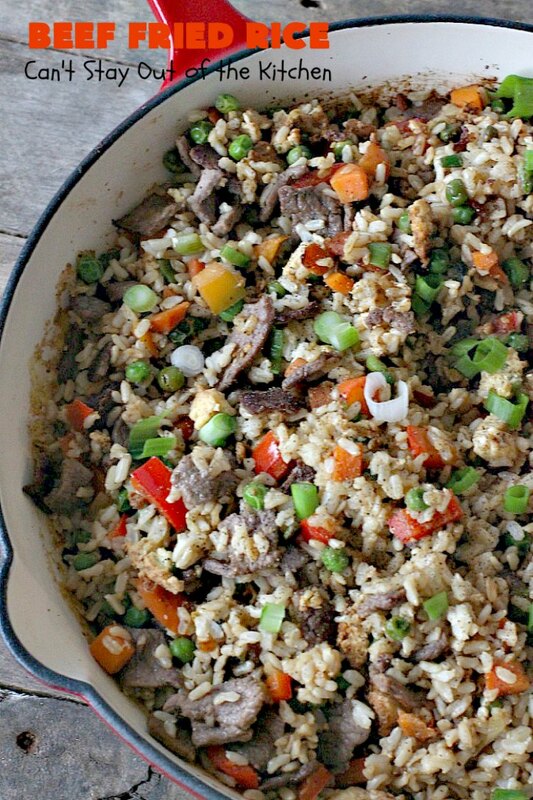 Beef Fried Rice has lots of veggies in addition to the beef, so it requires a lot more rice than most recipes. When I cook up brown rice, I usually use 3 cups of water for every cup of rice cooked. It plumps out really nicely that way. Then after cooking the rice, it’s refrigerated before adding it back into the recipe later. While Beef Fried Rice is neither gluten free or vegan, it is a lot healthier than many main dish entrees. It’s certainly worth giving a try. You can mix and match veggies and include others you prefer. It’s a very versatile recipe. Like I said earlier, it’s really terrific for making up bulk into freezer meals. Beef Fried Rice is absolutely terrific. This entree is so delicious. It’s perfect to make up for freezer meals. 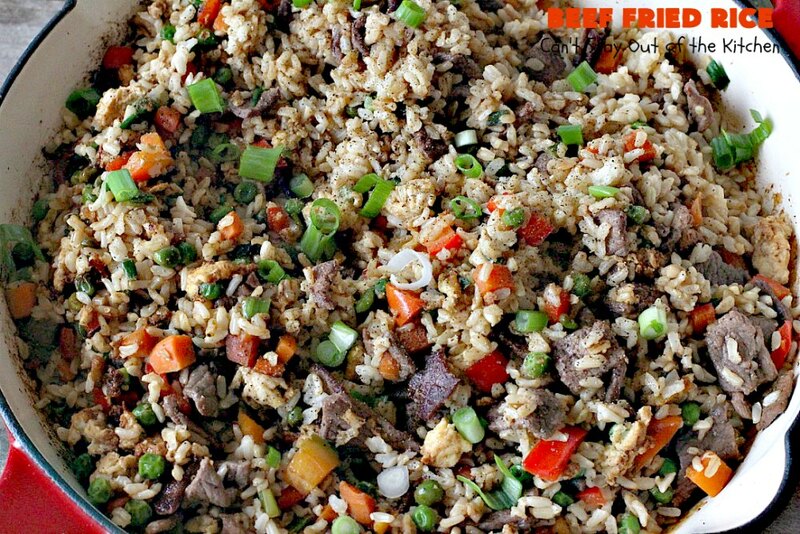 I love Beef Fried Rice. 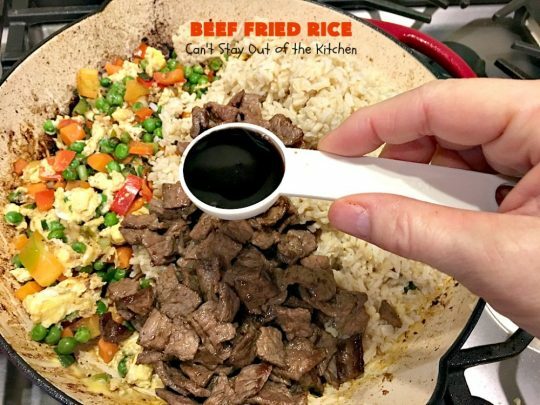 The gluten free low sodium soy sauce and oyster sauce add a delicate balance of flavor to this recipe without making it too salty. I used these ingredients. The beef is pre-sliced which is so helpful. 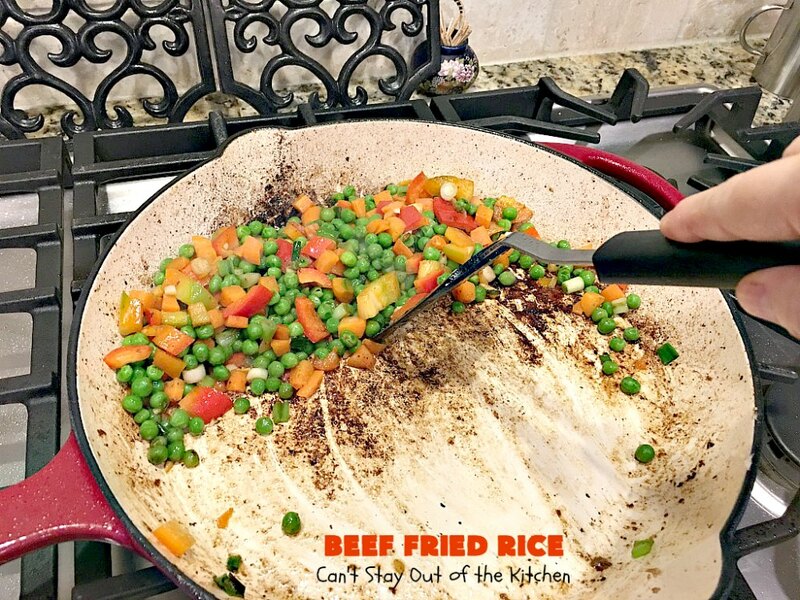 If the beef is too thick when you stir fry it, it will be tough. The jar under the black pepper is pink Himalayan sea salt. I also used avocado oil. Oyster sauce is NOT gluten free because it uses soy sauce. Most soy sauces (except the one pictured here) contain gluten. Season the beef with salt and pepper. Cut down in small pieces. Saute beef in a large skillet over medium heat in avocado oil and stir fry until cooked completely. 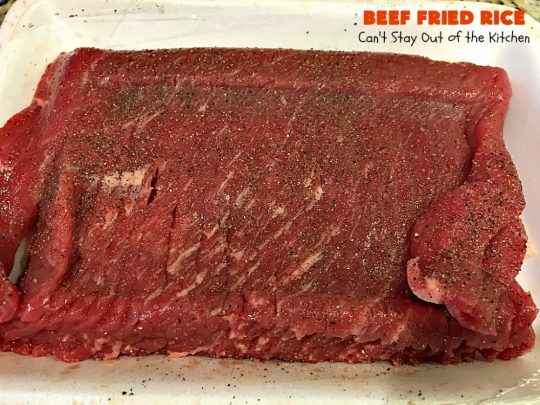 Transfer beef to a paper-towel-lined plate. Add additional avocado oil to skillet. Add peas and carrots, red bell pepper, green onions, ginger and garlic. Cook a few minutes until veggies are tender. 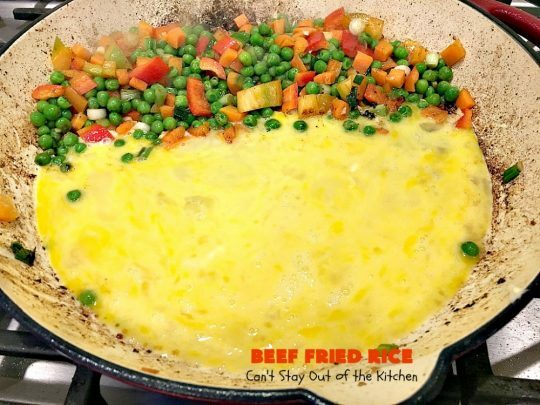 Move veggies with a spatula to one side of the skillet. Reduce heat. Add beaten eggs. Slowly scramble eggs until done. 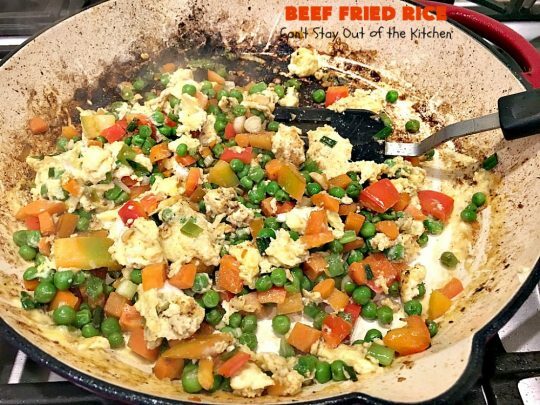 Stir scrambled eggs into veggie mixture. 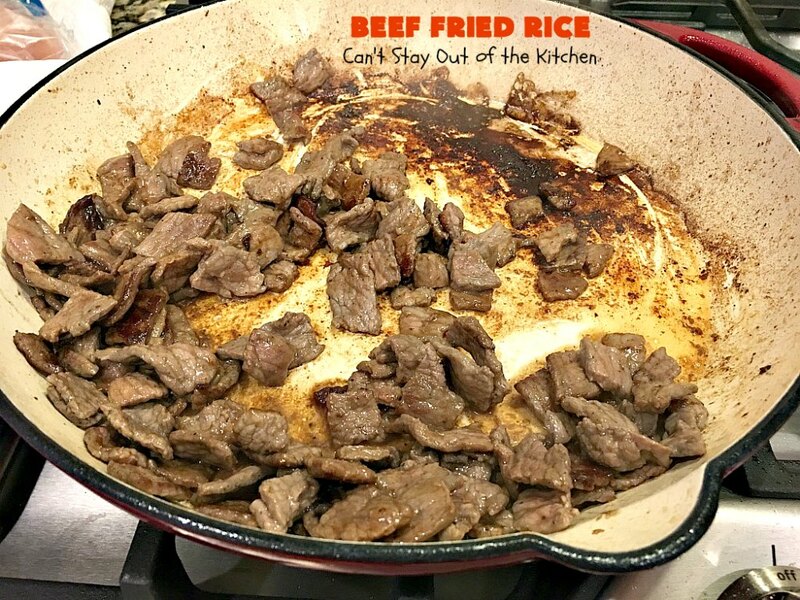 Add cooked beef and cold, cooked rice. Add gluten free low sodium soy sauce and oyster sauce. Heat veggies through and serve. Garnish with additional salt and pepper if desired. 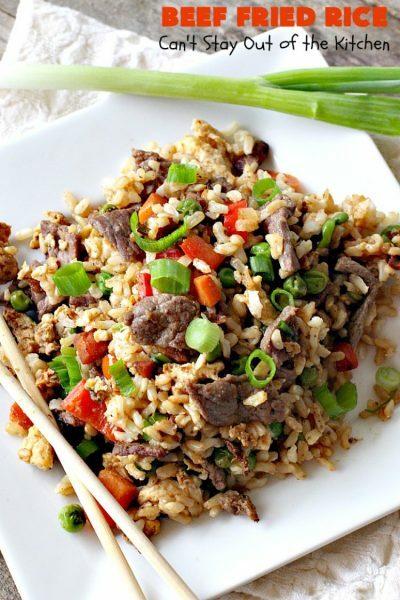 Garnish Beef Fried Rice with additional fresh green onions. 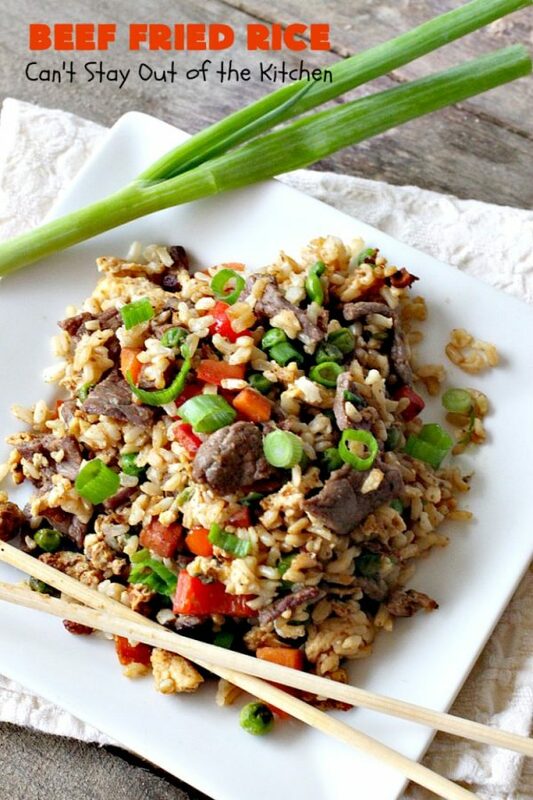 This is terrific as an entree or as a side with any Asian dish. I packed it up in bowls for the freezer to eat later when I don’t feel like cooking. 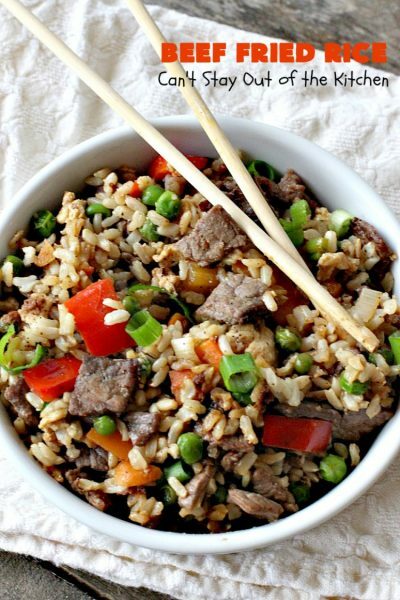 Beef Fried Rice is so tasty. 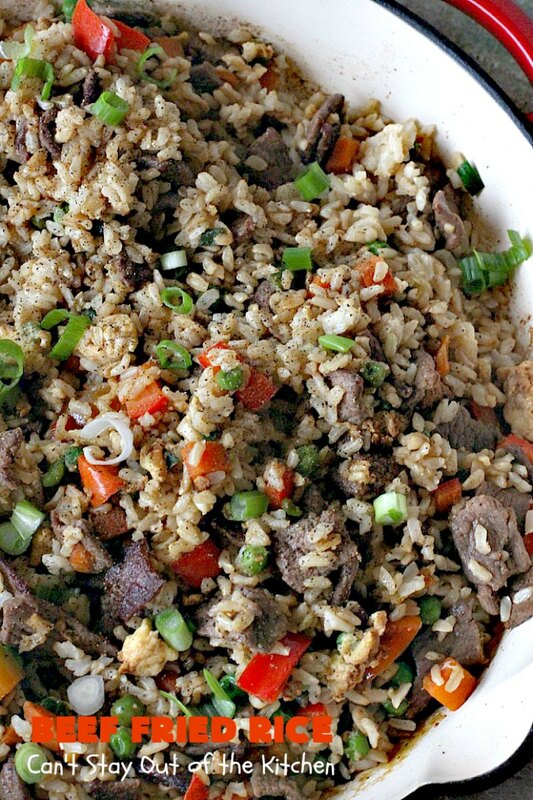 It’s one of those recipes you can make in about 30 minutes (if you have pre-cooked and cooled the rice). This easy 30-minute recipe makes a delicious week night meal. 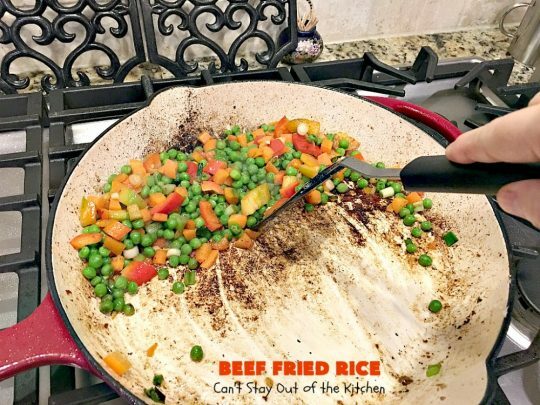 It's filled with beef and veggies and tastes heavenly. 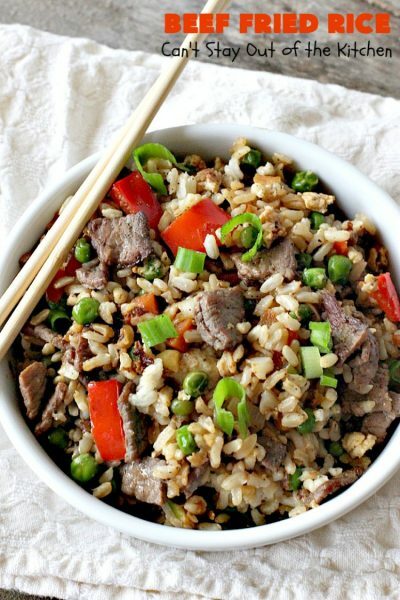 Serve it as a main dish or a side with another Asian entree. Heat two tablespoons sesame oil in a very large skillet over medium-high heat. Add beef and stir-fry, cooking meat until cooked through—about 5 minutes. Remove beef from heat and set on paper-towel-lined plate. Add remaining 2 tablespoons oil to skillet. Then add frozen vegetables, green onions, bell pepper, garlic and ginger. Stir-fry veggies until tender, about 3-5 minutes. Push vegetables to the side of the skillet and add beaten eggs. 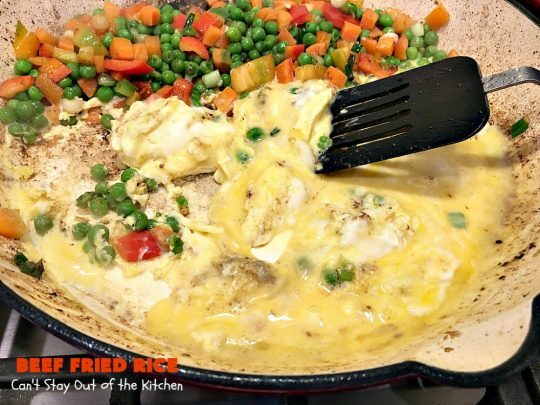 Scramble eggs then break into pieces while scrambling. Stir in to remaining veggie mixture. Add cooked beef, cooked rice, Tamari soy sauce and oyster sauce, if you’re using it. Garnish with green onions to serve. NOTE: You can add a can of sliced water chestnuts and bamboo shoots, drained, if desired. NOTE: I recommend you have all your veggies and meat cut and the whole recipe ready to go once you begin heating your oil. It cooks very fast and you need to have everything ready. NOTE: Oyster sauce uses soy sauce in the ingredients. Most soy sauces are NOT gluten free (except Tamari). 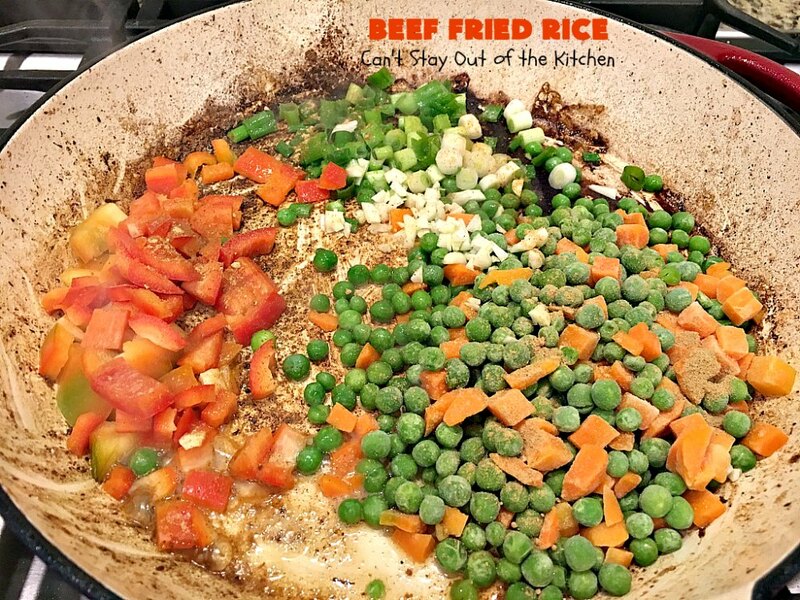 If you desire to keep this recipe gluten free, then omit the oyster sauce. 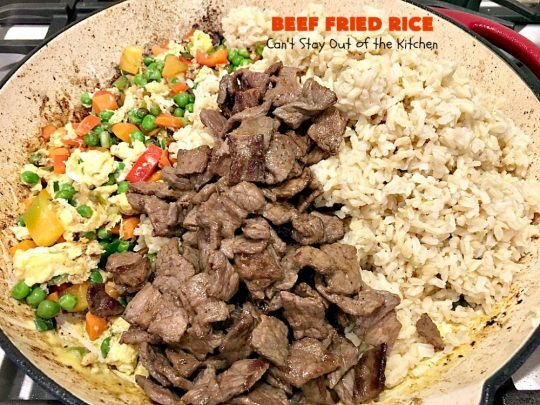 NOTE: I actually preferred using six cups of prepared rice for this amount of meat and veggies. This yields about 10 servings. 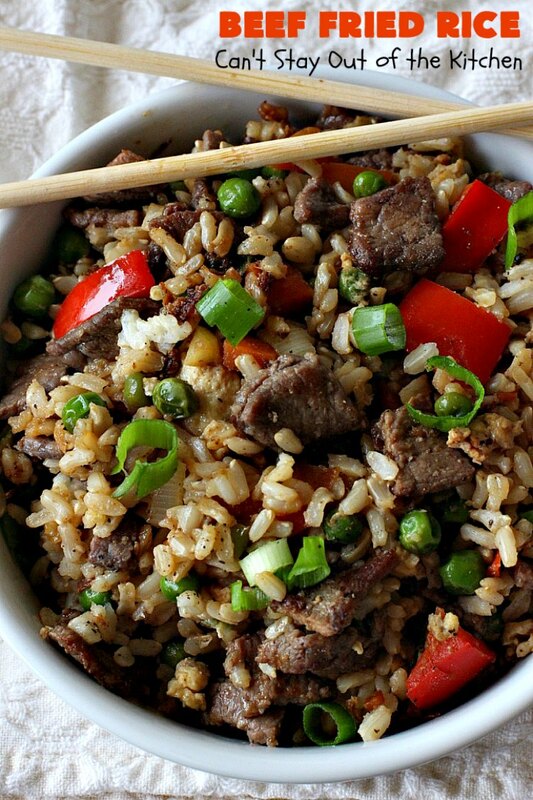 NOTE: Preparation time does not include time required to pre-cook rice and allow to cool before using in this recipe. This healthy entree is easy and delicious. The fried rice is chocked full of beef, peas, carrots, green onions, garlic and brown rice. This recipe makes a lot. It’s great for company. Prepare to drool. 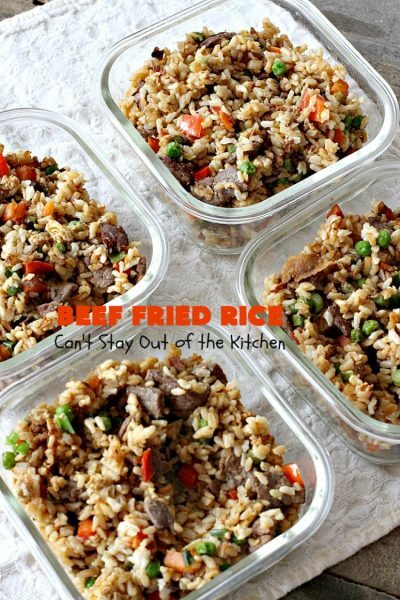 Beef Fried Rice is addictive!